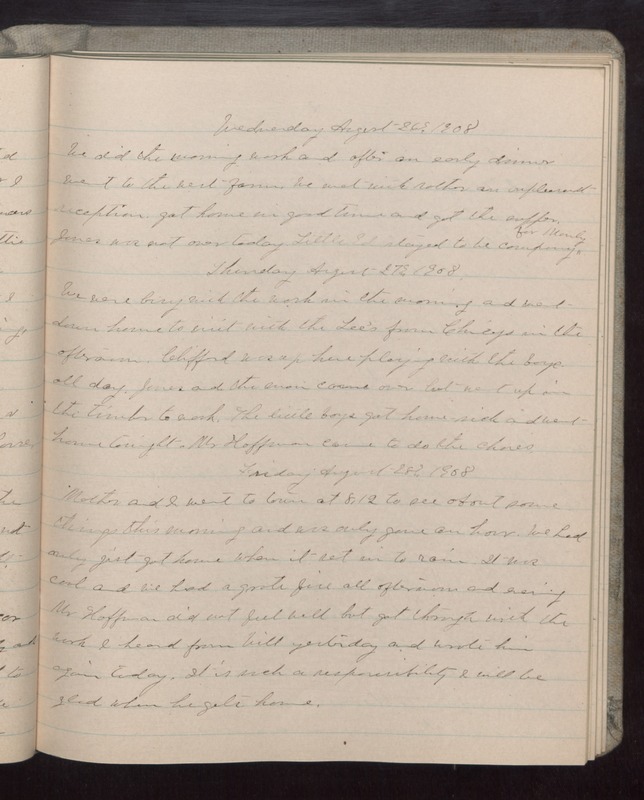 Wednesday August 26 1908 We did the morning work and after an early dinner went to the west farm. We met with rather an unpleasant reception. got home in good time and got the supper. Jones was not over today. Little Ed stayed to the company for Manly. Thursday August 27 1908 We were busy with the work in the morning and went down home to visit with the Lee's from Chicago in the afternoon. Clifford was up here playing with the boys all day. Jones and the men came over but went up in the timber to work. The little boys got home sick and went home tonight. Mr Hoffman came to do the chores. Friday August 28 1908 Mother and I went to town at 8.12 to see about some things this morning and was only gone an hour. We had only jist got home when it set in to rain. It was cool and we had a grate fire all afternoon and evening Mr Hoffman did not feel well but got through with the work I heard from Will yesterday and wrote him again today. It is such a responsibility I will be glad when he gets home.